I’ve avoided buying a “smartphone” for a long time now because I didn’t want to pay the extra $30 a month for a required Internet connection. That $360 add-on to my cell phone bill per year isn’t really necessary, given I’m rarely away from an Internet connection and my laptop. Still, working in technology and occasionally writing about mobile innovations, I felt it was important to finally get a fancy smartphone. But which one? I have been on Verizon ever since my first cell phone, and wasn’t ready to switch since I’ve been fairly happy with the service. I really wanted an iPhone and I’ve been waiting for Verizon to get one, but the AT&T contract ties up the iPhone w/ them until at least 2010. And given that my old phone disappeared, I needed a replacement and didn’t want to tie myself up with another two years on Verizon. I looked at the Droid and the Droid Eris but wasn’t impressed. The iPhone just felt right and the design — hardware and software — was way more intuitive and slick than the clunky Droid. So I walked into an AT&T store and made my purchase. I’m still in denial of how much I’ll be spending on my phone each year. $80 a month is not cheap. But I think it’s worth it in my industry. The good news is that my iPhone is already paying back for itself. My boyfriend and I were out looking for a place to grab dinner and we found a local restaurant that had a 25% off coupon online and went there. The more I can use my iPhone to save, the better I’ll feel about the monthly service charge! How many of you own a smartphone? How much do you pay per month for your phone? It’s funny how the cell phone companies make it seem like you get some extra special deal on buying a new phone every two years. I guess some people like to get replacements of their gadgets every two years, but I tend to hold on to my electronics for longer than that. My iPod? I don’t plan on replacing it for a long time. Heck, if it still works, I’ll use it when I’m 50. But cell phones… dare I keep one longer than two years? Never. Well, the truth is this time around I actually lost my last phone (about a month ago) and despite being confused as to where on earth I put it, I’m splurging on a new, discounted-with-two-year-contract phone. My tastes in gadgets (and everything else) tend to go by looks first, features second, quality third. That’s not always the best way to pick out a big-ticket item. Luckily with phones there aren’t that many options… which makes it somewhat easier to shop and decide. Yesterday I checked out the latest Verizon phones at their Circuit City store and was hoping to fall in love with one that would be free after the rebate and my contract discount. Of course, I fall in love with one that will cost me $129 after the various discounts. Oh bother. After trying to get my heart set on one of the cheaper phones, I did some research on the different phones and decided I really, really, realllly wanted the $129 one. At least this year I did research, right? 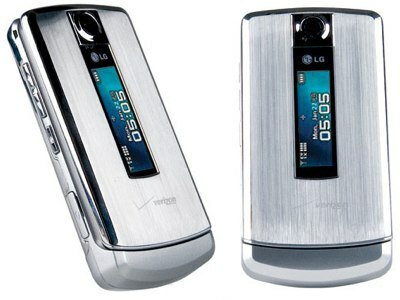 Last time I got a Verizon brand phone and despite being black and shiny it was a crappy phone. This time around I’m going for an LG (that supposedly gets good battery life and decent phone quality). I can’t wait to get the phone. I ordered it online, so it comes next week. Perhaps some of you remember the saga of my previous employer and the cell phone bill that kept showing up on my bank account. In short — for my full-time reporting gig, I bought a cell phone through AT&T for work — my boss told me to do this and he would reimburse me. That all went over fine. A few months and a firing later, the nightmare began. On the last day of work, after a long conversation with AT&T on the phone, it sounded like the account would be transfered to my boss and all would be fine. But then the auto pay bills started showing up on my bank statement. One in December, then one in January. I finally called AT&T and after 3+ hours on the phone with them (which ended up costing me something like $100 on my Verizon cell phone that I used to call them) you’d think everything would be solved. They talked to my boss again and he re-gave them permission to transfer the account to him. I am just so frustrated and I don’t know what to do. Not only is this costing me lots of money (which will hopefully be reimbursed at some point), it’s also costing my boss lots of money. As soon as the account is transfered to him, he was going to change the monthly plan to the lowest cost one, so he wouldn’t have to pay $106 a month. Except they just can’t seem to figure out how to transfer it to him. Add in to the mix that this former boss of mine just had a heart attack. It’s not exactly the best time to be bugging him with this… but I also can’t keep getting charged $106 a month for a phone I no longer have! What should I do?? Do I have any rights here? I don’t want to spend another zillion hours on the phone with AT&T because it seems that gets me nowhere.